About "NKJV Minister's Bible Brown (Red Letter Edition)"
Pastors and church leaders stand ready to meet the needs of their flocks. 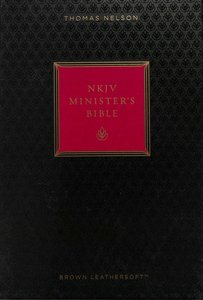 And Thomas Nelson's beautiful and durable NKJV Minister's Bible is here to help. With sermons, readings, outlines, prayers, and more, this Bible is a one-stop resource, offering direction for weddings, funerals, communion and baptism services, confirmations, dedications, and a variety of other pastoral care situations.